The Black Warrior River drains portions of 17 counties in Alabama. The area the river drains, its watershed, covers 6,276 square miles in Alabama and measures roughly 300 miles from top to bottom. The Black Warrior River watershed is home to over 1 million residents and contains 16,145.89 miles of mapped streams. Its headwaters consist of the beautiful Sipsey, Mulberry, and Locust Forks. Once these rivers merge west of Birmingham, the Black Warrior River proper forms the border of Jefferson and Walker counties. Near Tuscaloosa, the river flows out of the rocky Cumberland Plateau and enters the sandy East Gulf Coastal Plain, forming the border of Greene and Hale counties in the Black Belt. At Demopolis the Black Warrior flows into the Tombigbee River towards Mobile Bay. Once heavily populated by Native American cultures, the watershed is now home to many of Alabama’s population centers. Birmingham, the largest city in Alabama, obtains roughly half of its drinking water from the Black Warrior and its tributaries. Bessemer, Cullman, Jasper, Oneonta, Tuscaloosa, and many other cities acquire all of their water from the Black Warrior River basin. People from all over frequent the river to swim, fish, paddle, and recreate. The river is also heavily relied upon for commercial navigation and industrial process water, making it a silent giant in the state’s economy. The Black Warrior River watershed is home to 127 freshwater fish species (4 of which are federally listed as endangered), 36 species of mussels (5 of which are federally listed as endangered), 15 turtle species (1 of which is federally listed as threatened), an endangered snail, and numerous other aquatic animals. The river is named after Chief Tashkalusa, the namesake of Tuscaloosa, Alabama. In Choctaw, “tashka” means warrior and “lusa” means black. 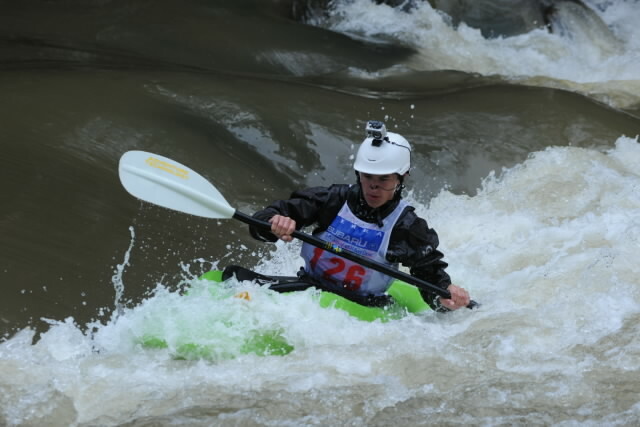 Team USA Kayaker Bennett Smith practices on the Black Warrior River’s Mulberry and Locust Forks.